We eat, drink and sleep content. Webstruxure provides content strategy advice and content services, including content creation and content administration, from our offices in Wellington. We can help document what goals you want to achieve for your content, and how you’re going to achieve them. Your goals can be anything from short term one-off changes to long term and multi-staged projects. Then we turn your goals into actionable documents, and from content plans to web content guidelines our focus is on getting results. We can support you to implement your new Content Strategy. Whether you’re lacking in time or resource we can help you make sure your strategy is put into action. We can audit your website and other online content (looking at both the copy and structure) and create a content inventory. This can be done as a stand-alone service where we provide recommendations and guidelines to improve the information architecture of your website, and/or the readability of your content. It can also be done during the planning phase of a web design and development project. We can read and review the content on your website and provide recommendations on how you can improve it. We can give you a general report on content quality or recommend specific changes, and if you want we can make those changes. We’ll review your content with an eye to readability, relevance, accuracy, currency and overall content quality, and if you have website content guidelines we can also point out any content that doesn’t meet them. We can help with the organisation, layout and curation of content, taking into account such matters as content structure (including mobile vs desktop devices), search engine optimisation, using plain language and best practices in writing for the web. where, how and when content will be distributed. Does your organisation have a plan for how its content will develop over time and contribute to your organisation’s online presence? This is a Content Strategy, and it’s a document which sets out what goals you want to achieve for your content, and how you’re going to achieve them. Your goals can be anything from short term one-off changes to long term and multi-staged projects. Your Content Strategy should consider copy, videos, images and other media, across all online assets your company owns or uses (website, blogs, social media, applications and any external sites where company information appears). If you already have a Content Strategy, can you honestly say it’s put to good use? Many organisations develop a web strategy or content strategy, but all too often the strategy is treated as a formal requirement with no bearing on the organisation’s actual work. It’s written, it’s approved, and then it’s forgotten. We think a content strategy that sits on the shelf is an unsuccessful content strategy. To create a content strategy that gets used, we first work with clients to capture an overarching view of their business objectives for the web. We don’t want to lay down a hard-and-fast plan for future development. Rather we want to capture ideas and opportunities and prioritise them, based on their feasibility and value to the business. Then we take an incremental approach to delivery, because many of our clients have great ideas and modest budgets. So we combine their business objectives with their web and content strategies to create an overall roadmap of website projects, to be delivered over time. As part of the website roadmap, a web content strategy contributes to the roadmap’s direction. And through incremental delivery the implementation of the content strategy (which can be a daunting piece of work) also becomes achievable. The roadmap itself isn’t set in stone, so it evolves as projects are delivered. Learning from small steps – rather than major projects – is key to efficient use of budget, as is judicious use of off the shelf or recycled functionality. SUBSTANCE – What kind of content do we need and what messages does content need to communicate to our audience? STRUCTURE – How is content prioritised, organised, formatted, and displayed? 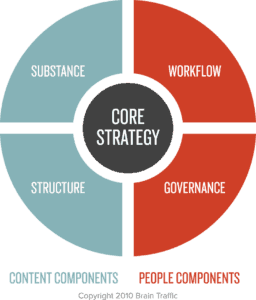 WORKFLOW – What processes, tools and resources are required to implement content strategy and maintain ongoing quality? GOVERNANCE – How are key decisions about content and content strategy made? How are changes initiated and communicated? Webstruxure works closely with clients to take them through each component of the quad, to ensure we understand the information needs of both their organisation and its audience, and any limitations or considerations relevant to its implementation. We aim to develop a strategy that contains realistic, incremental, implementable steps, and that is adaptable to the changing needs of both the client and their users.